SWIMMING POOL LED LIGHTS AND SPA LED LIGHTS and PAR56 LED REPLACEMENT LAMPS FOR POOL & SPA. • Underwater LED lights using the latest technology in LED lights. • Extremely long lasting life, up to 50,000 hours of life. • Exists in white or color (green, red and blue) LED. • 100% manufactured in ABS with extra protection against UV. 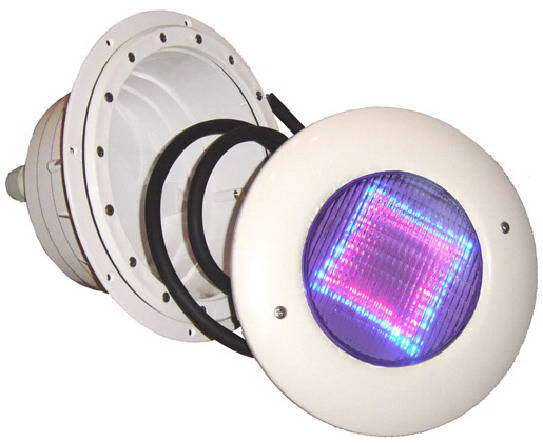 • LED pool lights can change colors automatically or be single color and can be remote controlled. Intermittent color fading. • With stainless steel face rim (optional). • Highly resistant against all chemical products. • For concrete pools and liner swimming pools. • Fully equipped with a 2. 5 meters line VDE certified (other lengths available on request). • LED pool lights are ideal for indoor pools, outdoor swimming pools and ponds where a long lasting and minimum maintenance illumination is required. • Use existing light power transformer source from 12 to 24 volts. • Replace conventional lights in minutes. • 300 Watts transformers can drive up to 15 lights!